Featuring: Elena S.Ab, Irene Koval, Ivan Lebedev, Alexander Kedrin, Dmitry Kedrin, Alex Kats, Michael Ioffe, Svetlana Levin. Runs from Saturday, October 22, through October 30, 2011. Opening Reception: Saturday, October 22nd from 5 p.m. to 6 p.m. The exhibition will run October 23rd through October 30th from 2 p.m. – 7 p.m. The museum will be closed on Monday, October 24th and Tuesday, October 25th. Irene Koval was born in Odessa. As a child she was traveling all over Russia with the Soviet Circus, where her parents were circus artists. Later she graduated from circus school and became a circus performer herself. All that time Irene was interested in art and was taking various art classes in the different parts of the Former Soviet Union as she was traveling all over the country. From 1983 to 1987 she attended the State Art Theatrical College in Odessa and became a property master puppeteer and art sculpture doll designer. After she graduated she was participating in numerous fine art exhibitions in Ukraine and Russia. In 1989 she immigrated to the United States and settled in New York. In 1994 Irene graduated from Fashion Institute of Technology (FIT) as a textile and surface designer. She was working for different design studios but love to the fine arts and theater never left her. Her experience as a circus performer strongly influences her art. Her last exhibition took place in a Butterfly gallery in Red Bank, NJ this year. Art, for Svetlana Levin, is a necessity. The creative process within her emerged at a very young age and has since only gained momentum. Ideas and creative solutions within the artist arise suddenly and seemingly from nowhere in an endless parade of shapes, colors, lines, textures and concepts. Svetlana never wonders about what to develop but rather how to illustrate her ideas within this reality. The thoughts that initially spring up as sketches of lines and curves are later transformed into the art you see today. Svetlana can be inspired by anything. Many of her inspirations arise from observations of people and nature. She finds it amazing how the shape of every individual is composed of sophisticated lines which cannot be altered without destroying the harmony of the creation. Svetlana Levin works to incorporate these complex and balanced lines into her paintings and drawings. Michael Ioffe was born in 1959 in Belarus. From 1979 to 1984 he studied art, architecture and design at the Belorussian Polytechnic School of Architecture in Minsk. After graduating in 1984, Michael worked as a graphic designer in Minsk until moving to America in 1989. For the past 18 years he has worked as a graphic designer and freelance illustrator for some of New York’s most prominent publications including the New York Times, New York, The City Journal and others, while at the same time developing his own distinctive art style. Michael applied this creative approach to a range of different media from paper and canvas to sculpture in ceramic and wood. 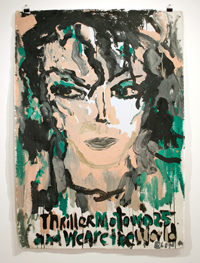 Michael’s work is represented in the collection of Kolodzei Art foundation as well as in private collections. While studying mathematics and economics at college Alexander Katsenelinboigen took a course in art history. 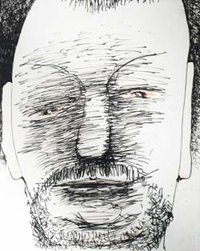 He was fascinated by various 20th century ‘isms’, particularly the ones that emphasized the conceptual aspects of art. Eventually he gravitated toward the more “visual” movements, such as post-impressionist and expressionist art, which employed innovative pictorial devices. As a source of inspiration, Alexander seeks images that conjure up ambiguity and distortion. This dissonance often provides the impetus for the work. He works primarily from sketches and photographs, often using a computer to mutate the image in order to test the various possibilities. As the work evolves, it moves from ‘naturalistic’ depiction to a pictorial idea that emphasizes expressiveness and innovative (hopefully!) complex interaction of pictorial elements. He works in a painterly manner using loose expressive brushwork. His results, to paraphrase Chaim Soutine, are not entirely banal. Dmitriy was born in Tashkent, Uzbekistan on Nov 4th, 1979. He is a son of the artist Alexander Kedrin and grandson of the artist and poet Benjamin Kedrin. He started painting at the age of two. He emigrated to the United States with his parents and attended New York University, where he studied art and biology, and Einstein College of Medicine, where he pursued studies of medicine as well as cancer biology. He found that simultaneous pursuit of science and art greatly influenced his paintings. His scientific work involved a great deal of visual work imaging moving cells inside living organisms, which he often incorporated in to his art. His poetry and visual art have been published in a variety of undergraduate and graduate student literary magazines. From 2004 he started participating in exhibits at the Museum of Russian Art in New Jersey. Ivan A. Lebedev – photo artist from Moscow, Russia, also a psychiatric MD. Born in 1959, he’s taken on a wide range of artistic projects in music, drawing, poetry, cinematography, etc. He achieved his greatest success in photographic art. In 1989, 1990 and 1991, the author held personal exhibits and partook in collective ones in Moscow (USSR), Vilnius (Lithuania) and France. In 1990 he joined the UNESCO International Federation of Artists (Moscow division of “photo and graphics”). He often identifies with the image of a “photographic hooligan”, exploring the boundaries between photography and painting.The pieces presented here are partly photographic and belong to a period during which the author was enamored with the exploration of physical artifacts present in film photography. The author always found the sensual and formal side of an image to be more important than an interpretation or logical one. In psychiatric terms, he is drawn to a paranoid view of the world. In the last two years Ivan has spent most of his time in Connecticut, where he concentrates on creating art in his own studio. He is a participant in Art SPACE in New Haven,CT, which is taking place right now (October, 2011). Also, pieces by Ivan Lebedev will be presented at Art Expo, New York (March, 2012). Elena Ab was born in Leningrad, USSR. As a child she moved to Jerusalem with her parents. After being discharged from the IDF (Israeli Defense Forces) as a sergeant she attended the prestigious Bezalel School of Art in Jerusalem. Elena holds a Bachelors degree in Fine Arts from the School of Visual Arts in New York City. While still in school she started 368 Broadway Studio Inc. located in Tribeca, NYC. The mission of the studio began as and continues to be to create an environment where emerging artists can create, exhibit and sell their work. 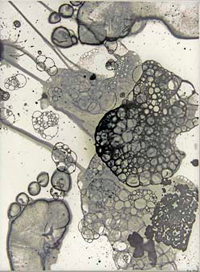 Her studio represents work of multiple artists in a variety of media including painting, drawing and photography. For the past ten years Elena has participated in numerous shows including the Manhattan Borough President’s Show titled “American Dream” and Jason Rulnick Gallery. She became an active Tribeca Open Artist Studio Tour (TOAST) artist in 2008. Her involvement with TOAST continued through the summer of 2010, including serving as a Vice President of the Board of TOAST. In 2009, after the death of Michael Jackson, Elena has decided to explore the influence of The King Of Pop’s life, music and death on our culture and psyche through a series of painted portraits which were received with great popular acclaim. She is continuing to explore this theme in greater depth with a new series of works coming out soon. Elena has spent years traveling the world setting her experiences to paint. She has been most profoundly influenced by her travels in Italy, Greece, France, Spain and Japan. Her giant canvases explore the interaction of myth, sexuality and religion. New York City continues to be a backdrop for Elena’s inspiration. She has expanded her studio/gallery and has found a new space at 350 Broadway in Lower Manhattan, where she can explore further and put her experiences through colors, shapes and composition. The current exhibition represents a new series of portraits influenced by New York City’s multiculturalism, energy, rhythm and sounds.